Unlike accuser #4, Herman Cain admits to knowing his latest accuser, Ginger White, who went on TV today to detail their 13 year consensual affair. Herman Cain yesterday said he doesn't recognize Sharon Bialek or know her. But Bialak and witnesses say differently, since a month ago at a function, Bialak was seen approaching him, hugging him and talking to him. One of the witnesses is WIND radio co-host Amy Jacobson. 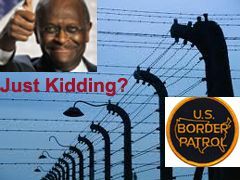 Herman Cain gave interviews and a press conference today. He denied ever meeting Sharon Bialek, known now as "Woman Number 4." He said he doesn't know who she is. And, he's willing to take a polygraph. Herman Cain will hold a press conference at 4 pm ET to address the allegations of sexual harassment made by "woman number four", Sharon Bialek. Cain is likely to be all fire and brimstone today. Expect a lot of righteous indignation. His campaign has sent out an e-mail to reporters that shows his strategy. You can read it here. Classic blame the victim, who he says has a history of financial problems and got fired from a lot of jobs. One section is called "Who is Sharon Bialek?" Herman Cain didn't cancel his scheduled appearance on Jimmy Kimmel Live. Jimmy opened the conversation with "So, how was your day?" Cain responded, "“Well, all things considered, I’m still alive." The poll showed the percentage of Republicans who view Cain favorably dropped 9 percentage points, to 57 percent from 66 percent a week ago. Among all registered voters, Cain's favorability declined 5 percentage points, to 32 percent from 37 percent. Cain insists he is "back on message." Where's he going to deliver it? Late Night TV. He'll be on Jimmy Kimmel Live Monday. Here we go again with Herman Cain and his ever-evolving abortion stance. First, in February, 2011, he says as President, he'd sign legislation protecting the right of the unborn. I am a firm believer in the dignity of life and support a ban on partial birth abortion. If I were president, I would sign legislation that would protect the sanctity of life. As Big Tent Democrat predicted the other day, Herman Cain has begun the walk-back from his seemingly pro-choice statements made the other day to Piers Morgan. Via Kos, he said today abortions should be illegal but it's up to each family to decide whether to have one. I am a firm believer in the dignity of life and support a ban on partial birth abortion. If I were president, I would sign legislation that would protect the sanctity of life. Additionally, I would be in favor of any legislation that would encourage adoptions as a loving and safe alternative to abortion. "I believe in life from conception, no exceptions." "I would have asked the Department of Justice to enforce the Defense of Marriage Act"
Why is "Gitmo" trending on Twitter right now? Because Herman Cain said on Wolf Blitzer today: If Al Qaeda demanded it, he'd consider releasing every detainee at Guantanamo in exchange for the release of one American soldier. BLITZER: Could you imagine if you were president…and there were one American soldier who had been held for years and the demand was al Qaeda or some other terrorist group, “You got to free everyone at Guantanamo Bay” – several hundred prisoners at Guantanamo. Could you see yourself as president authorizing that kind of transfer? Republican presidential candidate Herman Cain’s 9-9-9 plan would lead to higher tax bills for lower- and middle-income Americans while most high earners would pay less tax than they do now, according to a new analysis. The 9-9-9 plan would translate into a tax cut for almost 95 percent of Americans with cash income exceeding $1 million, according to the analysis released today by the nonpartisan Tax Policy Center in Washington. The Associated Press has more. If you want to crunch the numbers yourself, here is the Tax Policy Center's analysis and charts. When I'm in charge of the fence, we going to have a fence. It's going to be 20 feet high. It's going to have barbed wire on the top. It's going to be electrocuted, electrified," Cain said. "And there's going to be a sign on the other side that says it will kill you."